Ultimate performance audio requires an ultimate performance cable. 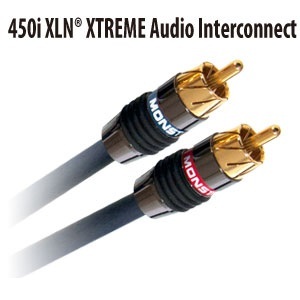 Monster 450i Series Audio Interconnects feature patented technologies including XLN® Xtreme, PEX™ dielectric and 3-way Time Correct® windings, and 24k Gold Contact 8-Cut Turbine® Connectors for a wider soundstage, pinpoint imaging and precision bass. But Monster performance doesn’t stop there. No matter what your system, you’ll experience powerful music, movies and gaming audio with maximum sonic clarity and stunning visual appeal. Separate high, mid and low frequency Oxygen Free Copper wire networks for the smoothest, most natural sound possible. Monster’s most advanced insulation isolated networks for faster transients and wider dynamic range. Provides massive 80dB noise rejection for crystal-clear sound, even at high volumes. For maximum connectivity, for a wider soundstage, pinpoint imaging and precision bass, optimal corrosion resistance and stunning good looks.